Neighbors on one East Hampton street are tired of dealing with a messy situation. 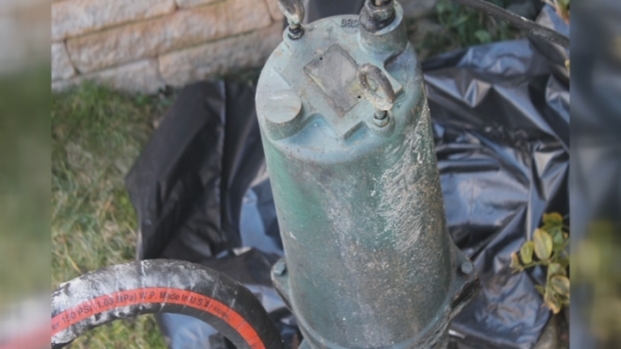 For years, Rob English has been dealing with a faulty grinder pump. In August, the pump malfunctioned and raw sewage poured into his basement, causing more than $5,000 in damage. "A new pump was installed in August and six months later on Saturday, it burned out again," English said. Six houses on Barton Hill Road with special hookups to the sewer line have spent thousands to maintain and repair failing pumps. English’s house sits down a hill away from the town’s sewer system, so his home needs what’s called a grinder pump. Six houses on Barton Hill Road, which were all built around the same time, have had the same problems. Residents want help from the town. "We have been pushed to the side and brushed off so much by this town and its officials, right now talk is cheap," said homeowner Edward Sawyers. The town has said the pumps are the responsibility of the homeowners. "We have done our best to educate all people about grinder pumps," East Hampton Public Utilities Administrator Vincent Susco said in a statement. "Mechanical devices are subject to failure if they are not maintained properly. We have suggested that the home owners get a service contract with the manufacturer so their pumps could be serviced regularly." The next town meeting on the matter will be on February 28.